A project of Stand True Pro-life Outreach which encourages respect for self and others through modest dress, action, behavior, and demeanor. “I praise you because I am fearfully and wonderfully made; your works are wonderful, I know that full well.” Psalm 139: 14. This verse confused me for years, but now it’s one of my favorites. I couldn’t comprehend what it meant to be “fearfully made”. How can someone be fearfully made? It’s not like God is fearful when making us, is He? I can’t really imagine God trembling as He knits us together in our mothers’ wombs, but maybe He knows we’re going to mess up and that makes Him nervous? That never seemed entirely plausible. Another theory of mine was that we were made to be in fear. Could that be true? Aren’t we made to stand in the face of injustice, at the gates of Hell and speak the truth? That doesn’t sound like it involves being fearful; it sounds more as if we are meant to be courageous. I had always heard that religious people were supposed to be “God-fearing” and that befuddled me. Of course God is all powerful. At any moment, He could destroy the world, but He is benevolent, He loves us and He wants what’s best for us. So why should I be afraid of God? Eventually, I decided that the only resolution to my confusion was to do some research. So being the millennial that I am, I procrastinated excessively and then finally Googled it. I was pleasantly surprised to find that when the bible was translated into English, “to fear” didn’t just mean “to be scared.” It meant “to respect.” Respectfully made. I am respectfully and wonderfully made. Ahh, that changes things. So now what does it mean to make something respectfully? God is an artist: the ultimate Artist. So what would it be like for a normal human artist to make something with respect? Well, if an artist just throws some paint on a canvas would that be respectful? Probably not. If an artist is painting something respectfully, he or she is taking time to plan, think out each and every step, and make sure it’s well done. The artist will make a sketch for what the painting will eventually look like and devise a specific statement or emotion for the painting to convey. The artist will plant subtle messages that make people think about society, or a bold message calling viewers to change, or create artwork just to make people smile. It is all planned. Once the painting is completed, it won’t just be thrown in the trash; it will be intended for a specific place to accomplish a particular purpose. Just like a masterpiece, God makes each person with a specific plan to accomplish certain things and convey certain messages. Not every person is meant to have the gentleness of Mother Theresa, or the boldness of MLK Jr. These two people were very different and were put in this world to glorify God in very different ways. Both were human rights activists who accomplished amazing things, and the world would look very different without them. However, they weren’t the same. We sometimes forget that in our search for holiness. At least, I know that I can get caught up in seeing the holiness of others and thinking that I have to be exactly like them. I am unique and weird, and that’s okay because I am fearfully and wonderfully made. God’s plan is so perfect that it not only allows for my weirdness, but requires it. No one else can follow God’s plan for my life, because no one else has the same strengths, weaknesses, and quirks that I have. His plan wouldn’t work for anyone else. I do know a little about God’s plan for your life and for mine: He wants us to love. Love is self-giving. Jesus giving His life for us is the greatest act of love that ever has or ever will take place. He calls us to follow Him and give ourselves in love in whatever ways we can. But the thing is, we can’t do that nearly as well if we don’t embrace who we are. We are all called to give deeply of ourselves, but if we are fighting ourselves, then what are we supposed to give? Instead, we must all learn to embrace who we are and be at peace with that so that the love we give comes from our inner God-given peace, which is a sanctuary for His love. So be weird, even if it goes against what society tells you to be like! There are societal pressures to conform, to fit in, to do what everybody else is doing, but God tells us to do the opposite: stand out! You see, being religious and following God is not about fitting into a mold. It’s not about acting the same way, dressing the same way or having the same routines as me or as your friends or anyone else in the world. In fact, it’s following God that will make you more you, because He created you fearfully and wonderfully and He has the perfect plan for your life that will bring you joy, fulfilment, adventure and peace. Following God, and so becoming yourself, and then proceeding to respect your awesome self makes you stand out. You might think of things you’ve done or things you don’t like about yourself and doubt your wonderful nature. Of course, we all turn away from our wonderful nature. That’s called sinning. Sins go against God and against ourselves. We have free will and are born with original sin, which causes us to be more prone to sin. Sin is not who we are, though. God defines us. Our fearful and wonderful nature defines us. The more we reject sin and the more we strive to be wonderful, the more we become our true selves! Following God really just means being yourself, but in the truest form. It involves breaking the bad habits and bonds of sin that have been created over time. To do this, sometimes we have to deny ourselves certain worldly pleasures. It’s tempting to look at those around us and wish we had their gifts. I seem to always be thinking “if only I was as good at math as my brother, I could use my skills to understand accounting and business to run a non-profit. That would glorify God,” or “If only I was as good at photography and writing as my friends, I could report on poverty around the world to bring awareness to it. That would glorify God,” etc. But God has a purpose for my life that only I can fulfill, and that is beautiful. Even when I forget about my talents or fail to see how they can possibly be used for God, He knows how they need to be used. That makes having a close relationship with God so important! He can see and understand the whole picture. Every last inch of it. He sees our problems, our joys, our rejection, our nature. In all the world, He knows exactly where the strengths, weaknesses and quirks He gave me can be used the best. Sometimes we wish that God would give us big flashing neon signs that say “GO HERE AND DO THIS!!!”. He doesn’t scream across the room what He wants us to do, but rather, He whispers it to us. In order for us to hear that whisper, we have to be close to Him, anticipating His words and reading His words in Scripture. Embrace who you are, because you are fearfully and wonderfully made! Are You Cultivating Circumstantial Happiness or Eternal Joy? What quality do some people spend their whole lives looking for, and others dedicate themselves to spreading? Some say happiness, but I say joy. Many people associate joy with happiness, and although they share similar effects, one fundamental difference separates the two. “Happiness” is defined by Merriam-Webster’s dictionary as “feeling pleasure and enjoyment because of your life, situation, etc.” Happiness is dependant upon external variables and can therefore vanish in a moment. For example, a simple smile from a stranger can turn your day around, or your happiness can be replaced with sadness by the evening news. Joy, on the other hand, is a gift given by God. It is a state of the soul. Joy is the effect of believing that God has conquered sin and death, and that He will bring His faithful to Heaven to be with Him for eternity. We can understand and accept this with our minds, but for this reality to sink into our souls, we must ask for the grace. It’s as simple as that. We need to ask God for understanding and joy. From the world’s perspective, we Christians live in contradiction. We are saddened by the horrors and hardships of this world, like human trafficking, murder, and divorce, but we still have joy of the soul. We have joy because of Christ’s Resurrection. We have joy because He has conquered death. We know that no matter what happens here on this earth, God is in control and only asks that we be faithful. Yes, these sins horrify us and compel us to do our best to bring God’s peace to our suffering world, but the problem is more than we can handle. God has already won the war. He just needs soldiers to fight the battles. Simple enough. Also, try to keep God’s glory, power, and goodness in the front of your mind to remind you of the reason for your joy! Christians are promised a life of joy if they love God and follow His commandments. More specifically, Christians are promised to live eternally with God. Joy is a gift of God and therefore, eternal life with God means eternal joy. With this knowledge and the tools to attain it, Christians are apt to strive toward Heaven, and therefore, toward joy. Atheists, however, can be joyful as well. Even if Atheists do not believe in God or the afterlife, they can be joyful through gratitude. Gratitude, according to Merriam-Webster’s dictionary, is “a feeling of appreciation or thanks”. Christians believe that gratitude is owed to God and it should therefore be an abiding state of being in their lives. Gratitude, however, is also expressed toward other people, too, and so when Atheists feel gratitude, they are in a way participating in the joy of Christ even if they do not believe this is so. 3.) Look for role-models who are joyful and observe their habits. 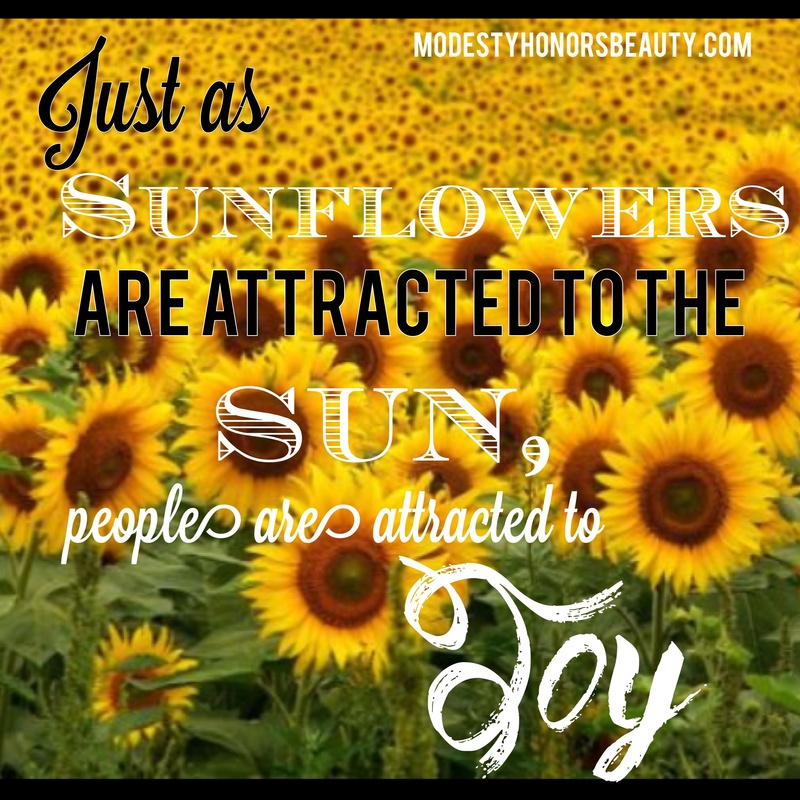 Just as sunflowers are drawn to the sun, people are attracted to joy. Those men and women who have joy are surrounded by others who inadvertently try to soak up and bask in that joy. Joyful people are peaceful and have a quality to life that others do not have. Those most noted for leading joyful lives are the saints. The saints kept Christ in mind continually and were grateful even when circumstances seemed unbearable. And of course, they were joyful. These saints are the examples for those of us still on earth, striving for Heaven. Emulating the saints’ habits will bring joy. Motivated. Dedicated. Focused. Ask and you shall receive. How Can Men Practice Modesty?